DURHAM, N.C. — Biomedical engineers have discovered an unlikely potential ally in the global fight against tuberculosis — an FDA-approved drug originally designed to treat cancer. Matrix metalloproteinases (MMPs) are naturally produced by animals to break down connective tissue for a wide array of biological processes such as wound repair, growth and tissue development. Many diseases, however, can hijack these enzymes for their own purposes. An increased production of MMPs has been strongly linked to the growth and metastasis of tumors. Many drugs have been created to inhibit MMP production, but have proven largely unsuccessful as standalone treatments to slow cancer progression in clinical trials. In a new study, biomedical engineers at Duke University show that these drugs may be more useful in treating tuberculosis. The results show that several MMP inhibitors, including the FDA-approved drug Marimastat, improve the structural integrity of leaky blood vessels in tuberculosis granulomas, allowing antibiotics to penetrate them and attack the tuberculosis pathogens in mice more efficiently. The study appears online on April 26 in the journal PLOS Pathogens. "Scientists have been focusing on the antibiotics used against tuberculosis for a long time," said Xiling Shen, associate professor of biomedical engineering at Duke University. "We thought maybe it was time to take a new angle by targeting the host's response to the disease instead." The World Health Organization estimates that more than one-quarter of the world's population is currently infected with tuberculosis. Although only 5 to 10 percent will become symptomatic and infectious, the disease kills more than 1.25 million people every year, making it one of the world's deadliest infectious diseases. Tuberculosis infection is also the leading cause of HIV/AIDS patient deaths. When Mycobacterium tuberculosis enters the lungs, the immune system attempts to contain the bacterial colony by forming a lesion around it called a granuloma. Unfortunately, the bacteria have adapted to make these prisons more like homes. "Tuberculosis is one of humanity's oldest pathogens and has even been found in ancient Egyptian mummies," Shen said. "It has evolved a very clever strategy to survive. 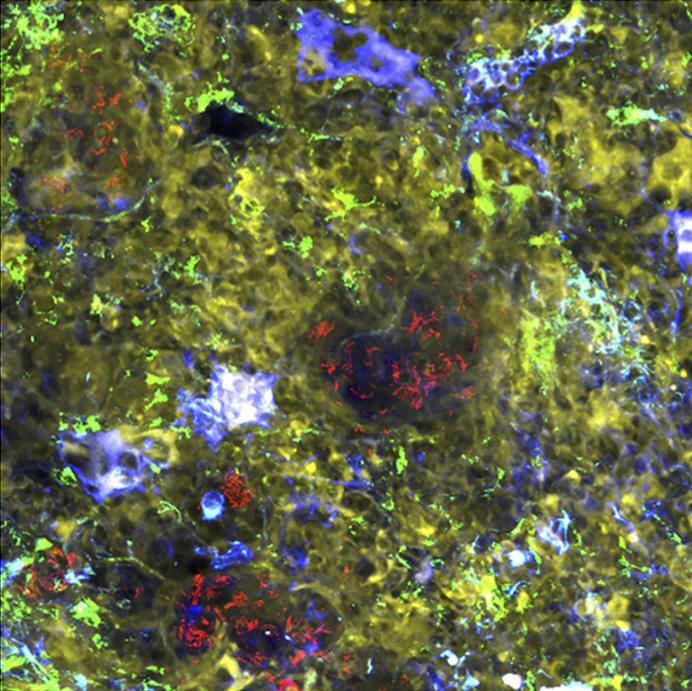 While these granulomas are meant to contain and destroy tuberculosis, the bacteria upregulates host MMPs to remodel the interior of the granuloma, essentially renovating their new homes to gain protection from the immune system and antibiotics." The M. tuberculosis can lie dormant within these granulomas for decades until something triggers them to become active. Once this happens, the disease becomes contagious again and kills roughly 15 percent of those who reach this stage. While scientists aren't exactly sure why or how this happens, illnesses that affect the immune system such as HIV are often the root cause. Thanks to the protection of the granulomas, tuberculosis is extremely difficult to kill even in its active stage, requiring a six-to-nine month regimen of antibiotics. And because many people struggle to stick with treatment for that long — especially after symptoms have subsided — strains resistant to multiple types of antibiotics are emerging. This is part of the reason why it is so important for researchers to find faster ways of curing the disease. A cancer specialist by training, Shen was working on a Defense Advanced Research Projects Agency (DARPA) project when he realized that the way tuberculosis manipulates the granuloma is very similar to the way tumors grow and metastasize. Knowing that MMP inhibitors had been shown to strengthen vasculature in tumors to better deliver cancer medications, he thought perhaps they would do the same trick in tuberculosis granulomas. Shen teamed up with a tuberculosis expert, Dr. David Russell at Cornell University, and showed that a number of different small molecule MMP inhibitors increased the effectiveness of frontline anti-tuberculosis drugs in killing the disease in mouse models. They demonstrated that this is accomplished by improving blood vessel health in the granulomas, allowing more of the antibiotics to be delivered and retained in the lungs. Shen hopes to test the idea in primates next, which could eventually lead to human clinical studies. This work was supported by the Department of Defense Advanced Research Projects Agency (19-1091726, 21-1073697, W911NF-15-1-0609) and the National Institutes of Health (R35GM122465).